Ballon Rouge proudly presents its third exhibition, Samuel Jablon’s Doomed, curated by Brigitte Mulholland. This is the artist’s first show with Ballon Rouge, and his second solo exhibition in Los Angeles. 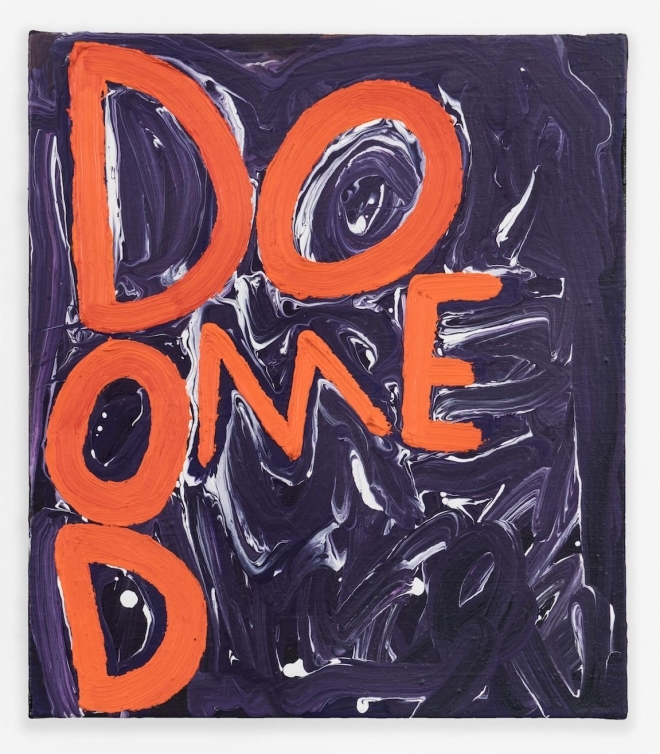 Doomed is a presentation of new paintings by Samuel Jablon, who paints words and letters as objects broken apart. His work is an amalgam of poetry and painting, where thick letters sprawl across colorful surfaces, forming apocalyptic words and phrases. Jablon's work mirrors the poetic confusion we carry inside as we struggle to describe the significance of a world reduced to an image on a screen, or the helplessness we feel when reading yet another awful headline. At a time when language and words are increasingly drifting from meaning, Jablon reminds us that words are embodied realities of human experience, used to connect and share with other human beings. In one painting, splashy pink and yellow hues meld into darker browns and blacks, announcing The damage is done don’t get stained. In another, a purple background, thickly built up and drizzled with white, is covered with a surprisingly bright and cheerful orange that boldly proclaims Doomed. Pushing against the numbness with which we trust reports of conflicts that we can only read about, Jablon’s paintings recreate and embody the terror and optimism specific to being alive right now.